I am sure you will all be aware of Fertility Network UK’s Scream4IVF campaign, aimed at ending the postcode lottery for IVF treatment. If you haven’t signed the petition yet which calls for a parliamentary debate on the subject you can do so here. The charity has been asking people to donate their scream on social media to give a voice to people with fertility problems and allow their frustrations to be aired. 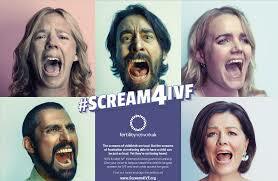 The screams will be collated to form the world’s longest scream for IVF to be played at a rally outside Westminster. The charity is encouraging people to join them at at the rally which takes place at Richmond Terrace at Westminster on October 10th from 5pm to 7pm.